In 2004, movie viewers were introduced to Pinot Noir, some for the very first time, when the movie Sideways appeared in theaters. While Pinot Noir was new to some, the variety has been around for centuries. The Romans began making wine from Pinot Noir in about the first century C.E. Today, wines made from this persnickety grape are highly prized for the complexity and depth of flavors, as well as variety of styles available. Pinot Noir grapes almost seem to have a mind of their own. They require precise growing conditions, favoring cooler temperatures with adequate rainfall throughout the year. While the right amount of rainfall is very important to the Pinot Noir grape, too much rainfall can result in watered down wines with anemic flavors. Pinot Noir wines from cooler regions tend towards concentrated flavors, including dark cherries, cocoa, leather, cigars, and mushrooms. At the same time, the wines draw flavors from the soils in which they are grown, which impart a complex earthiness. Pinot Noir wines range from subtle works with great finesse to powerful, structured wines with a backbone of fruits and tannins. In warmer growing regions, Pinot Noir grapes yield fruity, lush wines with a sublime edge of ripeness. These Pinot Noirs are lucious, juicy flavor bombs reminscint of sun-ripened, jammy fruits. Pinot Noir is usually a stand-alone varietal. The structure and flavor profiles of the grapes require little blending with other grapes. While some winemakers occasionally bend Pinot Noir wine with other varietals, the best Pinot Noir based wines are those that feature the grape all by itself. The one excpetion to this is sparkling wine or Champagne. While Pinot Noir is a red wine grape, the wine gets its color because winemakers leave the juice in contact with the skins. Pinot Noir juice not left in contact with the dark skins is white in color. When Champagne and sparkling wine makers use Pinot Noir in their wines, they use the white Pinot Noir grape juice, combining it with Chardonnay grapes. Pinot Noir grapes are used exclusively in the Blanc de Noir variety of Champagne or sparkling wine. Pinot Noir wines most likely originated from wild varieties of grapes originally grown in the Burgundy region, although some viticulturists suspect that the species came to Burgundy from ancient Greece, and then adapted to the unique growing conditions of central eastern France. For many centuries, the Catholic Church controlled nearly all of the Burgundy Pinot Noir vines. During the French Revolution in the late 1700s, however, the new government seized the grapes from the church and distributed them among families in the region, resulting in many small, family-run vineyards and wineries. While many countries grow Pinot Noir, the grape has a special affinity for certain regions. Along with the Champagne and Burgundy regions in France, you will also find extraordinary Pinot Noir wines from the Wilamette Valley in Oregon, as well as in Sonoma and Napa in California. Other American Viticultural Areas also grow Pinot Noir wine grapes, although they are not as well-known as Oregon and California. Elsewhere around the world, you will find production of Pinot Noir in Canada, Australia, and New Zealand. Some Pinot Noir wines age quite well, particularly those from Burgundy and Oregon. On average, a Pinot Noir wine may age from one to eight years, depending on the structure of the wine. Young Pinot Noir wines tend to be fruity, and as they age more subtle flavors come out from behind the fruits. Age softens these wines significantly. Drinking them past their prime, however, results in a sub-par wine with flavors that have watered down or simply slipped away. Because Pinot Noir is so delicate with its flavors, you need to drink these wines as soon as you open the bottle. 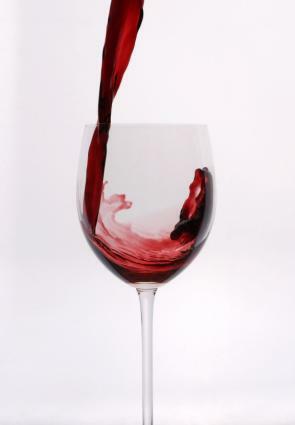 Unlike other reds, aerating the wine is unnecessary and may even damage the flavors. Because of this, you should pour Pinot Noir wines directly from the bottle instead of decanting. Serve in a traditional Burgundy style wineglass, which allows you to breathe in the wine's aromas as you drink them. Store Pinot Noir wines at between 50 to 55 degrees Fahrenheit away from light, vibration, and temperature fluctuations. Serve the wines at slightly cooler than room temperature, about 55 degrees Fahrenheit. Drink wine from an open bottle within a day, and make sure you recork a bottle with leftover wine tightly. Pinot Noir pairs well with lamb, salmon, mushrooms and dark meat poultry. Pinot Noir wines range in both price and flavor profiles. Try some of the following wines. Pinot Noir can be mysterious, gentle, powerful, fruity, or refined. Each bottle offers up the flavors of the sunshine, earth, and the grapes from which the wines are made. Sample a variety of Pinot Noirs, and you are bound to discover one that you will return to again and again.